Recently we posted a tutorial on “How To open disk management on windows 10 pc to manage drives?” And now, we are adding top 5 best free windows 10 disk management tools 2019. So no need to go for manual task. These windows 10 disk management pc software will make everything easy for you. Added top 5 free partition software and tools can be use to to manage pc drive without any hassle. For example, Shrink, expand, combine, and split partitions for free with these excellent disk partition management tools Or software. As we all know, now a days large disk space in pc or laptop is not special thing. Every new laptop or pc comes with 1 TB or 2 TB disk space. But if your new pc or laptop drives are not managed properly and suddenly becomes slow or C drive gets full, you have to mange your hard drive partitions properly. Probably you may know that most of all modern operating systems contain built in tools for creating, deleting, or resizing partitions. But everything is manual, so many users want to use free third party disk management tools & software. Practically, they helps you to make it easy for you. As we already told you, there are so many third part disk management pc tools and software are available. Same as, their user interface and working process may be different for different disk management tools. But they helps you a lot. To make it easy for you, we are adding top 5 best and free Windows 10 Disk Management Tools for you. So no need to go anywhere. Just check below list of free Windows 10 Disk Management software and find the best working disk partition tool. All the listed free Windows 10 Disk Management Tools are able to full fill your basic needs: creating, deleting, or resizing partitions. 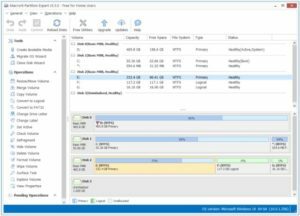 EaseUS Partition Master is the #1 free Disk Management Tool for windows 10 including all w10/w7/w8/w8.1 OS. If you try to search, it have aprrox 10+ Million satisfied customers in all over the world. Same as, they are serving this service since last 10 years which is seriously noticeable. Simple and easy user interface. Small software allow you drag left and right to shrink or expand a partition. Basic disk management tasks like basic partition management, wiping partition, checking partition, recovering lost partitions and SSD 4K alignment. If you have premium version of this tool then it can helps to enable you to manage dynamic disk. 80% of the features are free that can fully meet your needs. So if you don’t want to go inbuilt disk management tool of windows OS, use this amazing free disk management software. Easy to use for all. Macrorit Disk Partition Expert Disk Management Tool is another big name in disk management tool segment. Basically it’s a free disk management software which allows user to extend, create and format partition, fix low disk space problem, manage disk space easily on MBR and GPT (GUID partition table) disk. Same as other free disk management tools its also allow users to o extend, create and format a partition, fix low disk space problem, manage disk space easily on MBR and GPT (GUID partition table) disk. Its free to download for all but 65% of the features are free. Basic requirements can be full fil by free version, otherwise buy the premium version of this disk management tool for advance tasks. Most important thing is that Macrorit Disk Partition Expert Disk Management Tool is a portable pc software. In short no need to install on pc. 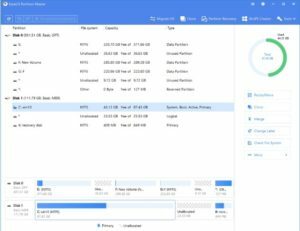 So if you are looking for free portable disk management tool for windows 10, Macrorit Disk Partition Expert tool can be good choice for you. Easy to use for all newbie and advance users. Free Portable windows 10 disk management tool. Macrorit Disk Partition Expert Disk Managemt Tool support 16 TB of hard disk. Macrorit Disk Partition Expert Disk Management Tool does not support dynamic disk. Premium version require to perform advance tasks. Paragon Partition Manager is another good name in the list of free windows 10 disk management pc software 2019. If you are really looking for best free disk management tool 2019, Paragon Partition Manager Free easily organizes your hard drive and redistributes free space to enhance system performance. 50% of features are free for basic disk management. Paragon Partition Manager have million of users from last 25 years. Paragon Partition Manager is older brand with safe, stable technology and professional software. Simple, free and beautiful user interface. Very limited feature are available in free edition. Registration is must to get serial number before use. In 4th position, we are adding Gparted Windows 10 Disk Management tool which is another best free windows 10 disk management tool 2019. Best thing about this Gparted Windows 10 Disk Management Software is that it also support MAC os including windows OS. So both windows and Mac users can use this free disk management tool. Moreover, This software is considered as GNOME (desktop environment composed of free and open-source software that runs on Linux and most BSD derivatives) editor. It’s a free disk management tool for windows and MAC users but it’s the best choice for advanced users. Gparted disk management tool support all windows os and mac os too. Doesn’t require any operating system. No need to reboot your pc after applying changes. This software takes long time to start up because you have to boot this software from USB or pen-drive. Last but not least, Cute Partition Manager is our final free windows 10 disk management pc software for all. Cute Partition Manager is another useful disk management application for pc that allows user to create and edit the properties of the partitions from their hard disk. Basically, It aims to provide you with the required tools to organize your HDD in different partitions. If you want to use this disk management tool then you have to create a bookable disk or floppy and load the application by restarting your pc for once. Once loaded, the application presents you with the options to add or to change the partitions from the detected hard drives. This tool is fully manual, so its highly recommended for advanced users only. files size is small compared with Gparted. These are top free windows 10 disk management tools which are really very effective to manage pc’s drives. As we already told you, some of them are very useful and easy to use for all newbie & advance users. So read the their detail and find out the best disk partition management too for w10 OS.